The National Institute of Justice currently defines a cold case as any case whose probative investigative leads have been exhausted. NamUs currently defines unidentified persons as people who have died and whose bodies have not been identified. Missing persons are individuals who are missing and, therefore, cannot be determined alive or dead. The FBI NGI database (formerly IAFIS) was updated and improved in May 2013. Part of this update involved making palm prints, joints, and civilian prints available for latent print searches. In October 2013, the LEU began running cold case prints through NGI. Were there any prints left unidentified? Of the unidentified prints found, were any prints suitable to run through AFIS/NGI? LEU also contacted agencies to determine if any cold cases had been resolved in-house. Note: Only authorized state agency personnel have access to NGI. Please, contact us if you have a cold case that you would like searched through the updated FBI NGI system. 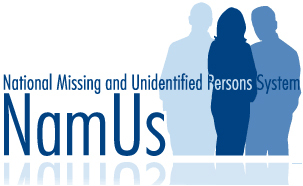 The National Institute of Justice's National Missing and Unidentified Persons System (NamUs) is a national centralized repository and resource center for missing persons and unidentified decedent records. NamUs is a free online system that can be searched by medical examiners, coroners, law enforcement officials and the general public from all over the country in hopes of resolving these cases**. LEU began utilizing NamUs in 2014 after a successful corroboration with the Oklahoma Office of the Chief Medical Examiner (OCME) on an unidentified person case related to a 1978 homicide case. The case involved an unidentified female that was found in 1978, and was fingerprinted at the time, but a search through fingerprint records at that time yielded no identifications. In 1982, the body was exhumed and photographs of the fingers were taken, and again searched through OSBI records with no identification made. In 2011, the OSBI Forensic Biology Unit began working this cold case and were collaborating with an OCME anthropologist. In 2014, the OCME anthropologist contacted the LEU in order to request the fingerprints of the unidentified person/victim be uploaded to The National Missing and Unidentified Persons System (NamUs). At that time, the LEU pulled the cold case and ran the prints through the new, updated FBI NGI and were able to make an identification to the unidentified person.